Dr. David Eifrig writes: It might sound crazy... but retirees can safely earn 12% to 20% income streams on their savings. My Retirement Trader readers have been using one strategy to rake in thousands of dollars every month. It's simple. And once you get familiar with how it works, you can use this strategy to safely and conservatively generate 12% or more in annual income on a retirement account. 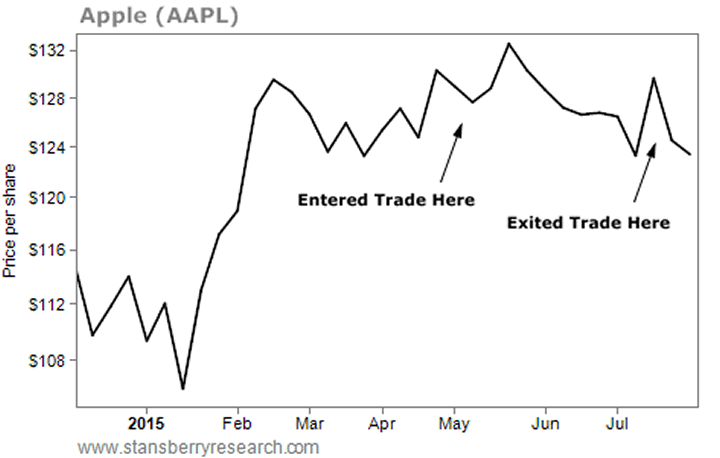 Consumer-electronics giant Apple (AAPL) is one of my favorite stocks to trade. It's cheap, dominates its business, and it's increasingly returning cash to shareholders through dividends and buybacks. Back in May, Apple's share price was attractive. People weren't excited by the Apple Watch and the rising share price had stalled for a few months. The stock traded at just 13 times earnings... an amazing price for a company with such growth. So in Retirement Trader, we recommended a trade that could have turned out one of two ways: We were either going to make a quick 16.4% (on margin) in three months (65% annualized) or we were going to buy Apple stock at a 4.7% discount to the current market price. We were going to win either way. And we did it by selling puts. Before you say, "Oh, it's an options trade. That's too complicated and risky," hear me out. I guarantee it'll be worth your time. When you sell a put, you're agreeing to buy a stock below the market price within a set time. You get paid for making that agreement. If the stock never drops below that price, you get to keep the cash. If the stock does drop below that price, the cash ensures you get a discount to that price. It's like getting paid to offer $250,000 for a house the buyer is asking $300,000 for. Here's the real beauty of this strategy: You don't have to be exactly right about how or when a stock will move up in price. Many factors work in your favor. So even if the shares stagnate, you still profit. You're only agreeing to buy the stock below today's market price, so you're safe as long as it doesn't completely tank. And you don't have to be right forever – just for two or three months (your obligation to buy expires with the option). It is, of course, possible to lose money on the deal. Every investment carries risk, and no one can predict the future. But selling puts gives you huge odds in your favor. It generates income and hedges your risk by getting you much lower entry prices on any companies you end up buying... great companies like Intel, Coca-Cola, and Apple. This kind of trade is much safer than simply buying stocks outright. And if you do end up buying one or two stocks, that's fine, too. If you think like a long-term investor, your entry prices will be low, and you'll end up buying dividend-paying companies that treat their shareholders well. In our case, that never happened. Apple's share price stayed well above $125 (the price at which we had agreed to buy Apple if its price fell) by the time our option expired in July. We collected the full 16.4% return in just three months. Meanwhile, investors who simply bought the stock only broke even. If you've never sold puts before, ask your broker for help setting up your account for these sorts of trades. Spend time reading about the strategy and make sure you're completely familiar and comfortable with it before you get started. The effort you invest will pay off many times over. If you're looking for a conservative, high-income, retirement-friendly trading strategy, you can't find a better tool than this. Editor's note: If you're new to selling put options, don't worry. Doc recently walked one retired farmer through a trade. And we filmed the entire transaction – from start to finish – so you can see exactly how Doc's strategy works... and why it has a 99% success rate since 2010. Learn how you can use Doc's put-selling strategy to collect thousands a month with some of the safest companies in the world right here.